When Christian Horner joined the newly branded Red Bull Racing team in 2005, he was the first of a new breed of team principals, lowering the age of the upper management on the pit wall by a considerable margin. Navigating the difficult waters of driver and teammate management, as well as handling the pressure from above as well, Horner has helped guide Red Bull from midfield pretenders to four-times world champions. Horner’s first taste of motorsport was on the driver’s side, as the British racer participated in the national F3 championship. He moved up to F3000, creating his own squad called Team Arden, but only picked up a single point from two years of racing. Realising he was better outside the car than in, Horner called it a day in 1998. He turned his attention to team management, pushing Arden to win their first championship in 2002. Unfortunately, the title was stripped from driver Tomas Enge who had failed to pass a drugs test. Undeterred, Horner repeated the championship success in 2004, with both driver and constructor’s title. Arden International expanded their offerings, now participating in Formula Renault 3.6, GP2 and GP3 with varying degrees of success. Having caught the attention of Red Bull, Horner was promoted to Team Principal of their F1 outfit, upon their debut in the sport. Joining at the tender age of 32, Horner was the youngest team principal at that time. Alongside chief designer Adrian Newey, Horner helped the team pick up their first podium in 2006 (forcing a dip in the Energy Station pool with very few clothes on), their first victory in 2009, and the first of four consecutive championships (driver and constructor) in 2010. 08/02/2015 Formula One 2015 Season - Before it happens! Team radio to Max Verstappen (from Christian Horner): "Max, you are brilliant. What an overtake. ""Oh that was a good one. I really enjoyed that one." Christian Horner, Red Bull: "Our best chance is on or after the first turn, and that first lap. Both drivers are pretty pumped up, hopefully they’ll give each other space… The one that’s going to be really interesting is Mercedes, because they’ve boxed themselves in tyre-wise, it’s going to be interesting how they run their race." Verstappen has made his way back to the pit wall and is chatting with Christian Horner. It sounds like his sluggish start might have led to a retirement anyway, regardless of the collision with Alonso. 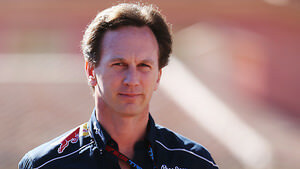 Christian Horner of Red Bull: "Starts have been okay, so hopefully we can get a decent start. In a perfect world we could get one of the reds or silvers ahead of us. I think, on a day like today, anything can happen. It's so windy, it's going to affect some more than others. It'd be very unusual not to have a safety car or at least a virtual safety car today." "It looks like Kimi's given up," Christian Horner says. Christian Horner confirms it is an engine failure, after they had just switched the car into a "race safe" mode. Christian Horner: "It was a sensor issue on the gearbox... and the car got stuck in sixth gear. An amazing job by the mechanics to get it turned around and back out into the race." A pretty thorough preview post and video by Red Bull has appeared, chatting to Christian Horner about the new car and the continuing driver line up of Ricciardo and Verstappen. Horner boils down the months and months of design work to this snappy little one-liner: "If it looks right, it tends to go alright." Christian Horner at Red Bull: "It's a shame because our drivers were saying get racing a few laps ago. As we know, once the cars are circulating quickly the water shifts. It's a shame we didn't get racing a few laps ago, but this is pretty consistent here." Christian Horner: "It looks like the last big chunk has come through but there might be a bit more behind it. We’re all weather experts looking at radars and trying to predict what’s happening but none of us have a clue. It’s obviously too wet to be out there at the moment."